Georgetown law professor and director of their Asian Law and Policy Studies Program, Viet Dinh is a former US Assistant Attorney General and the chief architect of the USA PATRIOT Act. Dinh clerked for appellate court judge Laurence H. Silberman and Supreme Court Justice Sandra Day O'Connor. In 1978, Dinh's mother took her children and fled Communist Vietnam in a 15-foot-long boat packed with 85 refugees. They landed in Malaysia. Six months later, the family arrived in Oregon and started life picking strawberries. During the Senate confirmation process Dinh's only "nay" vote came from Hillary Clinton -- presumably over his participation in the Senate Whitewater investigation, and to a lesser extent the impeachment trial of her husband. When Dinh finally did join the Justice Department in April 2001 as an Assistant Attorney General, John Ashcroft admonished: "The art of leadership is the redefinition of the possible. I want you to be the think tank to help me redefine the possible for the Department of Justice." As history would have it, this very thing did in fact occur 45 days after the terror attacks on September 11. 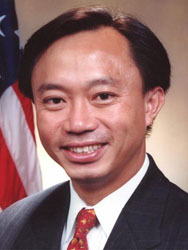 Dinh was commissioned to draft a piece of legislation granting sweeping new powers to law enforcement. Created with input from other DoJ luminaries like John Yoo, the law would eventually become known as the Uniting and Strengthening America by Providing Appropriate Tools Required to Intercept and Obstruct Terrorism Act, a piece of legislation that inspires great pride in its chief architect. According to Dinh, the narrowly-focused bill received a great deal of scrutiny: "Congress was very involved with process in refining, adding and in some times deleting some of our proposals. [...] The USA PATRIOT Act served a very, very central purpose. That is: to update the law to the technology, so that the terrorists and other criminals with criminal and harmful intent cannot evade investigations simply by switching cell phones or changing from phone to Internet." CHABOT: Can you tell us how many times, if at all, library records have been accessed under the new FISA standards and the USA PATRIOT Act, and if they have been so accessed, have the requests been confined to the library records of a specified person? DINH: [...] In light of the recent public information concerning visits to library, we have conducted an informal survey of the field offices relating to the -- its visits to library. And I think the result from this informal survey is that libraries have been contacted approximately 50 times based upon articulable suspicion or calls -- voluntary calls from librarians regarding suspicious activities. Most if not all of these contacts that we have identified were made in the context of a criminal investigation and pursuant to voluntary disclosure or a grand-jury subpoena in that context.